Happy New Year! Tonight I wanted to eat some Chinese food in celebration of Chinese New Year. Oh man! It is soooo busy in Irvine, since all the Asians are preparing for New Year's Eve. I took some funny pictures to show you what Sam Woo BBQ looks like on this special day. I swear there is like 50+ roast ducks hanging in the window and half a boar. I went around 4:30pm and I had to wait for over half an hour just to order a whole duck and some roast pork to honor my grandparents. After we were done, we went over to the dining side to eat dinner. As expected that service wouldn't be great. Most Asian places are like that, I am sorry to say. Today especially because the whole staff was on the BBQ side, which the line was out the door now. I am glad I got there early! Even though I had duck and roast pork already, I had to order the Three Delicacy Platter for dine in. 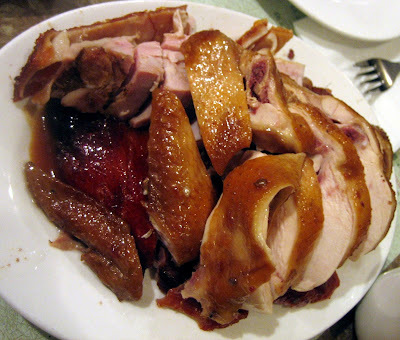 I chose to have Soy Sauce Chicken, Roast Duck, & Roast Pork. Surprisingly, the portions were extremely generous and very flavorful! I thought that it wouldn't be tasty because they had to MASS produce all the food today. The roast pork was superb and tender with very little bones! 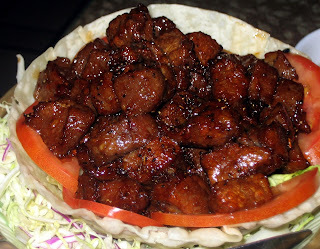 The pieces of chicken were moist and flavorful with little bones as well. Only the duck was kind of skimpy, but overall delicious. For entrees we ordered French Style Pepper Steak and Wonton with Yee Mein (Noodle) Soup. The pepper steak was generous in portion and packed full of flavor. I wish they had more onions at the bottom, but I am not complaining about the amount of steak they gave. The only thing is I didn't see it on the menu and I knew that Sam Woo Seafood, the restaurant next door, had it. Without knowing how much it was, I ordered it. BIG MISTAKE! I mean it was good but not $16 good. Okay, I am not being cheap, but if you are Chinese you KNOW that is waaaay over priced for a dish. The appetizer and my noodle soup didn't even add up to that. I think they ripped us off but I didn't see it on the menu so you can't really argue the price. Still it was good but I will not be getting the same dish next time. The noodle soup was okay, not what I was expecting. 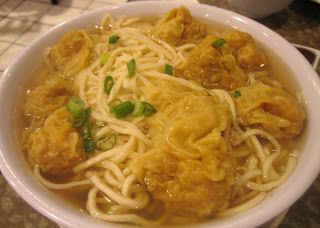 I recently went to the Sam Woo in Monterey Park and their wonton noodle soup was MUCH better. The noodles were completely different, but the wontons were delicious at both places. I have to say Monterey Park is much better and half the price, but what can you do when Irvine is one of the wealthiest cities around. All in all, I was pretty satisfied with dinner. Definitely a place to go if you want a cheap meal togo. Word to the wise, go to the BBQ side if you are doing togo to get the 3 plate combo for like $5. Got to love cheap Asian food!